Had a great day fishing the championship for the Yellowfin Cape Lookout Shootout presented by Nationwide and Yamaha king mackerel tournament on Saturday November 18th. Started the week off thinking we would be running to Hatteras to fish, but after checking temperature charts and talking with a charter captain in Hatteras we determined the big fish were not there so time to regroup. With all the north wind and cold temperatures we decided off the beach in deeper more stable water was the place to be. Heard of some fish at the East Rock so after checking out at 6:00 on Saturday morning we rolled it to the East Rock. The water was not warm, but the bite was!! Caught a low 20's fish at about 8:00. The other boats that were around were catching some fish and the word started to get out to the other competitors so other boats were coming. We worked around the edges of the crowd and about 8:30 the long lined blue fish took off. After about 20 minutes or so we were able to gaff the fish and put it on deck! We knew it was a good one, but during November there are lots of good ones so we kept fishing until 1:30. Decided it was time to go weigh as the scales opened at 2:00. When they finally settled at 51.24 pounds we all let out a huge cheer! The biggest king we had ever weighed and ended up the tournament winner!!! What a great way to end the season with winning the Championship. Thanks to a great team of Ron Dorsey Sr., Jon Dorsey, Matt Gravitt and Trey Grady for making a plan come together and letting me run the boat! What a fantastic Saturday of fishing. We were participating in the 3rd leg of the Cape Lookout Shootout KMT. This was a rescheduled date for the tournament due to Hurricane Matthew. The fishing was off the chart. 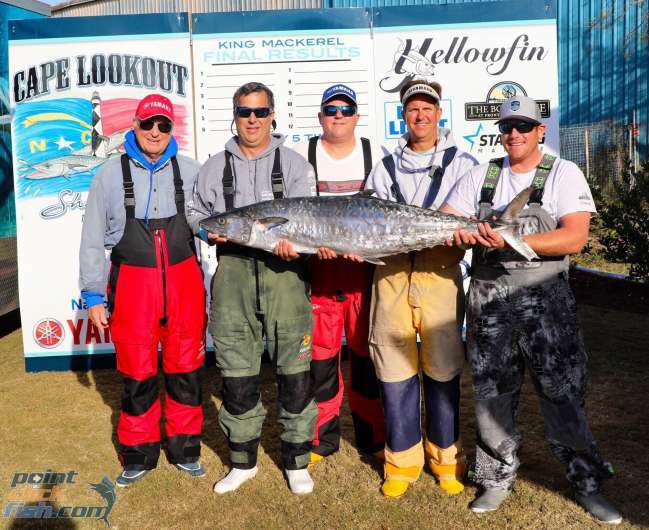 In this series there are only 60 boats and on Saturday to make the top 12 where the payout ended it took a 41.37lb king mackerel! 43rd place was a 30lb fish! That is just phenomenal NC fall fishing. 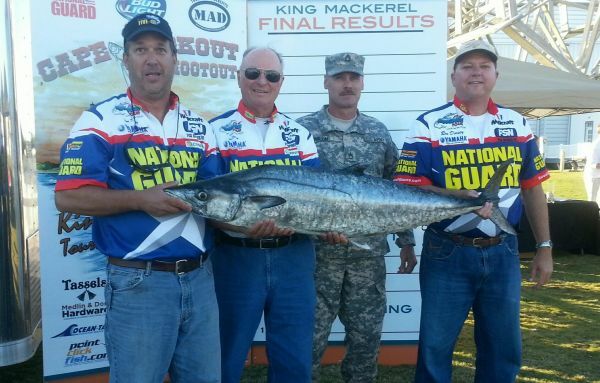 Our team was lucky enough to finish 9th with a 43.46lb fish. We caught 12 kings for the day releasing most of them. If you get a chance to get out in the next couple of weeks go have some fun because the fishing is awesome!!! Got lucky yesterday and caught a 41.75 pound king mackerel in the Raleigh KMT to finish 2nd. Would have loved to win it but congratulations to the Milco team with a huge summer fish of 53! Super happy to have ours and had a very fun day with my father Ron Dorsey Sr. and a great friend Trey Grady! If you don't have them get yourself some of the Sportsman Cool Breeze shirts from the Sportsman store. They offer sun protection, are cooling to wear and very reasonably priced. They are the shirts we are wearing!!!! Finally got a chance to get off the beach and chase the blue water Pelagics. As with everyone else it got rough for the ride home, but we had a fantastic day fishing. Ended up with 21 Mahi, 2 weehoo and a sailfish. Was so glad that my dad, who is 77 years young, was the one to catch the sail. It was his first as he never fights fish. 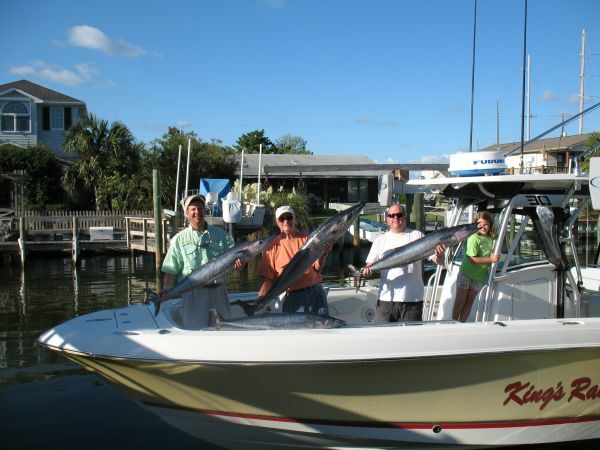 We fished down around the 460's thanks to blue water supermap. Can't wait to hit it again. 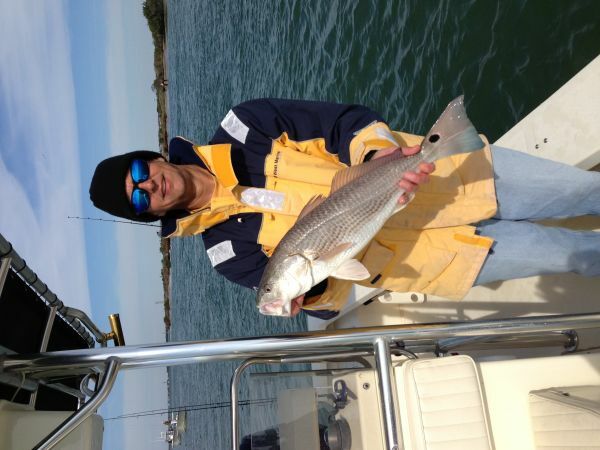 Enjoyed a fantastic Saturday fishing for Kings off of Beaufort Inlet. The weather was excellent (other than the super thick fog that morning) and the bite was on. Ended up catching 8 in about 3 hours and missed another 5 or 6. Attached is a picture of an upper 30's that we released to live another day. Decided to go give the big Spanish a try on Sunday morning, August 9th. Had Sargent Trevor Hanlon of the North Carolina National Guard and his son Jordan on board with me. The wind being out of the NE had the beach slick so we headed down to AR 315 with pogies in the live well. Unfortunately nothing at 315. Did have a few baits chased and swirled on but no commitments. Moved on down the beach and were lucky enough to have Jordan catch his first Spanish. Not a huge one but a nice fish. Thought it was going to be on but the sharks commenced to wear us out, 2 and 3 on at a time. fished till 10:30 and called it a morning. I love to take kids and have them experience the beauty of the ocean and all that it has to offer! Gave the flounder fishing a shot yesterday morning out of the inlet. Ran out to one of the wrecks and tried jigging. A little rough and I was not able to get on the wreck and stay at it. Ran back inside and tried drifting behind Shackelford. Ended up catching 5 flounder of which only one was a keeper at 17 inches. One of the others may have been a keeper, but I had forgotten my measuring tape so didn't keep it. Had a blast and hope to get after them again soon! Caught all the fish on gulp white curly tail minnows! All caught on incoming tide. Last Saturday May 30th was the Military Appreciation day in Morehead City. This is a day that you take active duty military guys fishing on your boat. The idea is one simple thanks. We were lucky enough to have 3 marines fish with us. 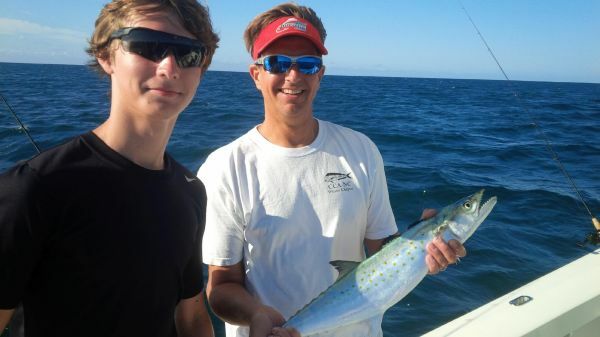 Unfortunately the bite was slow for us and we only caught 3 dolphin, but the guys enjoyed themselves and had a great day on the water. 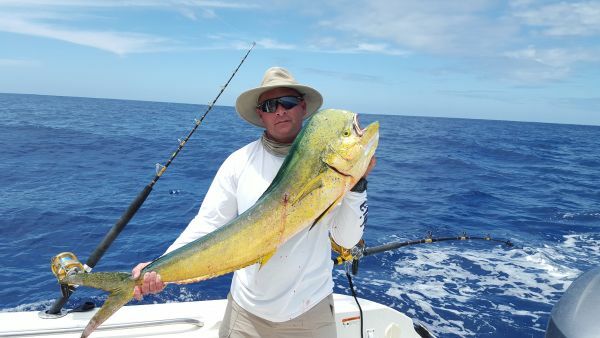 Attached is a picture of Stacey Carpenter with one of the dolphin (mahi) that we caught. Thank you guys for your service! Headed up to the Outer Banks for a couple of days chasing Yellow Fin Tuna off of Oregon Inlet this past week. Fished Friday and ended up with 3 tunas and 3 mahi. Not the best day, but came home with some sushi and great memories with friends! Ready to chase some gaffers off of Beaufort this weekend!!! 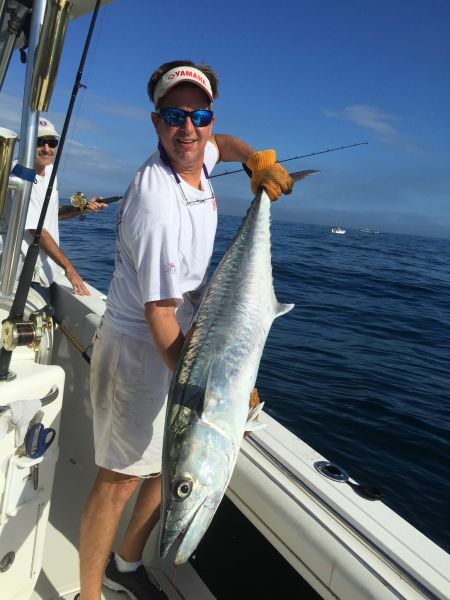 What an incredible weekend of King Mackerel fishing! We were fishing in the Cape Lookout Shootout King Mackerel championship and were fortunate enough to come out in third place with a 48.72. congratulations go out to the Sic Em team with an awesome 58 pound fish to win the Championship! One of the best fishing days that I have had in a long time as the fish were chewing! We caught at least 12 kings releasing most of them since we had a bigger fish in the boat. 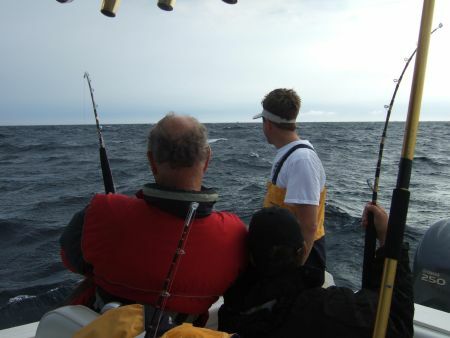 We fished off of Hatteras, but I heard the fishing was great from North West Places all the way to Hatteras. 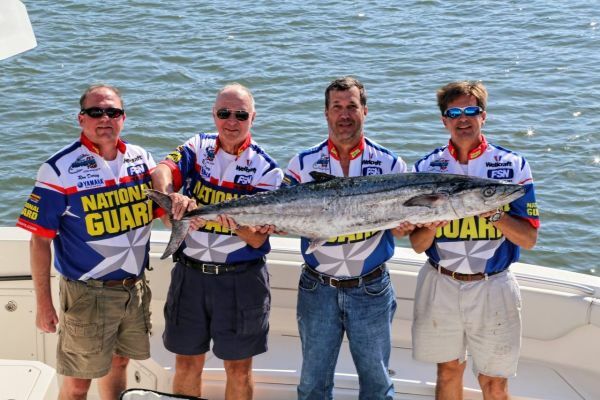 I am attaching a picture of the fish with from left to right, Matt Gravitt from Richmond, Ron Dorsey Sr. from Henderson, Sargent Trevor Hanlon of the North Carolina National Guard from Morehead City and Jon Dorsey from Henderson. The fish really fooled us on the weight as it was so short and fat. Really a funky looking fish! Anybody ever seen such a hump back king mackerel? Fished the third tournament this past Saturday in the Cape Lookout Shootout King Mackerel Series. We got lucky on the east side and won the tournament with a 48.28. She skied the bait so we knew it was a good fish, but didn't know how big until in the boat. Our first win since 1998 so it was a great feeling! With this past Saturday looking so nice my father and I decided that we would try and catch a speckled trout. The trout bite was not great, but we had one of those incredible mornings that you always remember. Ended up with 2 trout 20' each, about 10 small throw back flounder up to 14 1/2' and 25-30 red drum from 19' to 25'! All of this was caught in 3 hours! So glad to get to do it with my dad! With the weather report looking great for Sunday, September 4th we decided to head off the hill and see if the great wahoo fishing that was going on before Irene came by was still going on. 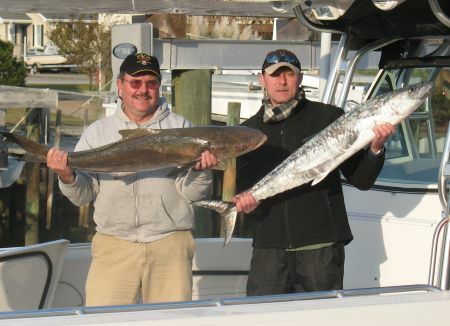 Got a report from Saturday that the fish were down south so we headed to the Swansboro hole. Ended up with 4 wahoo and a blackfin tuna. Pulled off at least 3 other wahoo and missed many more blackfins as I was pulling big baits for the hoos. Beautiful day fishing with my Dad and brother. It has been many years since just the 3 of us went! If you get a chance to go do it now. The bite is on! Sorry for a bit of a late report. Had a large group of guys down at AB last weekend, Nov.5th - 7th, with one coming all the way from Denmark. With the forcast calling for NW 15-20 I didn't think that we would be able to get off the beach too far. Luckily the weather man missed it. The initial plan was to sneak through the inside cut and see how it was on the East side. Got over and the water was not bad at all. Ran out to the George Summerlin Reef. Missed a bite before boating one king about 12-15lbs. We were looking to cook fish for the evening so we had dinner. Shortly after caught a real surprise, a cobia, so we had some great dinner. The wind kept on laying and getting better so ran out to the East Rock where the bite was the week before. Didn't mark much bait, but caught a mid 20's fish there and missed one more. Not a huge amount of fish, but had a great time with friends and did not take a bit of spray on the windshield. What looked to be a no go turned into a beautiful great day! After trying to put together a trip up to fish Oregon Inlet for the last 2 years, it finally came together this past weekend. Having spent many summers growing up fishing out of Oregon Inlet, it had been 8 years since I had been up there so everything was very different. Boy the OBX are no longer just a fishing beach!!!! Ok back to the fishing: Got there Friday night with the intentions of getting everything ready on Saturday and then going down to OI Fishing Center to see what happened and see if I could learn a good starting point. Talked to a few of the private boats and got us a good starting point; the 675 line in 100 fathoms! With all of the different shoaling that goes on and all the changes to the inlet, I followed out a couple of charter boats to make sure that we didn't start our fishing laying on a shoal! Cleared the inlet about 5:30 and were treated to a beautiful calm ocean. Put the lines in about 7:00 in 71 degrees in 100 fathoms. Got all 7 lines set and started working offshore. We were in 500 fathoms and were just getting settled in when all hell breaks loose. First left short comes tight, then rt. short then right long then left long then both flight lines. We had six fish screeming and the tunas were busting on the spreader bar teaser set up. Pulled one off quick and then chaffed one off on another line. Still have 4 on. Settle the 4 guys in and I get the gloves and gaff out. After 15 minutes of fighting we are still not gaining much on them. These must be a good class of yellowfins! After 45 minutes we are still hooked up and wondering who has who! Finally at the one hour mark we get color and confirm what we were all beginning to think; BIG EYES!!!!! Boat the first one and then go to work on the other 3. Shortly after boating the first we have one pull off. My old man who is 71 was fighting this one and I think he was more happy to not be hurting than disappointed to have lost the fish. Next fish comes up and we sink the gaff, 2 down and one more to go! This fish is really bull dogging and not coming up. We get a little too impatient after an hour and 45 minutes we unfortunately break him off. We are all dissapointed, exstatic, jelly armed, sweating and just in awe of the strength of these fish. I have caught 400 lb bluefins on stand up gear and they seemed nothing like these fish. These are the first Big Eyes that we have ever caught and were very happy to have them. We continued to look for yellowfins, but didn't find any. It sounds like a slow day when you only catch 2 tuna, but we could not have been happier. Learned alot about the fish and hope to get another chance to tangle with them again! Got a chance to run offshore last Saturday with the beautiful weather that we had. I cannot remember a prettier Easter weekend than we had. Left the dock in Atlantic Beach at 0500 Saturday morning and pointed the boat for the NE Corner of the Big Rock. I had studied the satelite images on Friday night and after talking with friends who had fished down at the Swansboro Hole on Friday with nothing I felt it was best to go to the Rock. We put lines in about 7:15 in 70.4 degree water. We trolled toward the Pan Am where the temperature had shown 72 from the satellite. 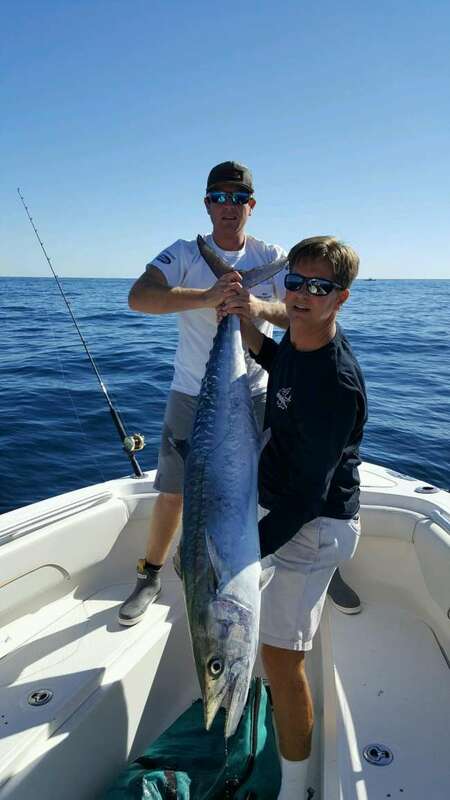 We got our one and only strike for the day about 8:15 and boated a nice wahoo that later weighed 52lbs. Unfortunately did not do anything else and it sounded like we were lucky to have what we did from talking with others. Never found any 72 degree water, but it was 71.7 at the Pan Am. I will try and post a picture later as one of the other guys on the boat had the camera. Even though it was slow fishing, it sure was nice to get back to fishing after a long cold winter. Did some flounder fishing out of Atlantic Beach last Saturday, July 5th. Lots of fishing but very little catching. Drifted with mud minnows from the inlet down Shackleford banks. Lots of small bluefish, very small sharks and only a few flounder. Ran out of 3 dozens minnows in 2 hours and switched to squid. Water looked excellent, but only one 15 1/2' keeper. Going to try again some next week. Anybody else catching much up that way? Fianlly got a chance to go fishing when the weather was good, though not as good as the weatherman had predicted. Ran about 30 miles out of Beaufort inlet. Decided to drift on the marks instead of anchor as the drift was only .5 knots of current. We managed to scratch out 3 gag grouper, 5 big sea bass, one silver snapper and about a 10 lb. dolphin. Caught a few short red grouper and a couple of AJ's as well. Had a school of dolphin come around the boat, but could not get them to eat anthing we had. All in all a great day on the water with friends. I will try to post pictures later as they are in someone elses camera. May give it another shot Friday of this week. Good luck to everyone on your next trip. Sorry for the late report, This is a second hand report as some of us have to work! Unfortunately the cobia fishing this past Friday was not too good. We fished at Cape lookout just inside the hook and did not get a single cobia. did catch lots of sharks including 2 beautiful hammerheads, one being about 5-6 feet and the other over 6 feet! For those looking for menhaden they were down the waterway towards Spooner's Creek around marker 19. Good luck to everyone fishing this weekend. It looks like it will be gorgeous! The hooks I use are mustad 7692 tinned in an 8/0. As far as leaders I use 80lb fluorocarbon for wind on leaders on some rods and have 100lb mono and 80lb flouro for regular leaders. You will need 1.0 and 1.3 size crimps so you can get the pin in the crimp with the mono. I use #8 or 9 wire for the pin. On the chin weight I use a 1/4 or 3/8 oz weight. 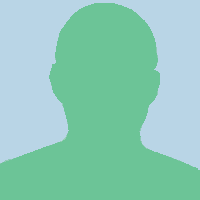 Good luck and post a report!!! It depends on the size of the reels that you are using. If you have 50 lb class tackle with lever drag reels like Penn Internationals or Shimano TLD 50's then you will be fine with straight 50 or 60lb mono as they have plenty of line capacity. If you have 30's or lighter then you may want to go with 50lb braid and a top shot of about 100 yards of 40 or 50 lb mono. This will give you the stretch that you need to not rip hooks out and possibly break outriggers, but have the line capacity with a smaller lighter reel. congratulations on a great catch! congratulations! Wow what a first deer. I know you are one happy father!! Way to go Captain Butch! Keep on putting them in the boat!! Sorry for not putting in all the names. Yes it is Ron Dorsey Jr on the far right. From left to right is Jon Dorsey, Ron Dorsey Sr., Matt Gravitt and Ron Dorsey Jr.
making my mouth water! They are delicious and fun to catch. Maybe later this week I will give it a try. There are some great guides in the Sneads Ferry/topsail area and that would be a great way to shorten the learning curve. It sure beats going out and not having a clue where to go. If you look under the businesses section in the guides there are some listed there. Also, NC Sportsman is having a fishing school on March 19th in Wilmington. The schools have always been very informative and are a great way to interact with other fishermen. Some of the instructors are guides that fish the Topsail area. I think there is an ad on the website here for the school. Kingsransom42 has not filled this section yet.